The E400 remains popular with vehicle owners who prefer an elegantly styled sedan that is also sporty and luxurious. The 2018 models underwent a few design upgrades that make the sedan even more appealing. 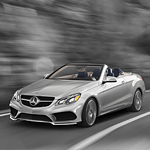 See the vehicle's face-to-face, and feel free to take a test drive at our Mercedes-Benz sales location. The first noticeable feature is the sedan's polished chrome grille that boasts the famous Mercedes-Benz logo. The body has slightly thicker flanks that offset the slimmer middle. The vehicle's graceful curves and aerodynamic design look sporty while being sleek and attractive. The highly insulated cabin ensures that occupants hear each other or their choice of music and not the road or environmental noises. The interior also features luxurious combinations of real wood, metal and leather accents. Explore all of the standard and optional amenities available on the E400 by visiting your nearby Mercedes-Benz dealer.